Time to grow your brand with Placeit's render mockups! Try this render mockup featuring an angled Amazon Kindle on a multicolor background, the perfect shot to showcase your unique designs in a professional way. 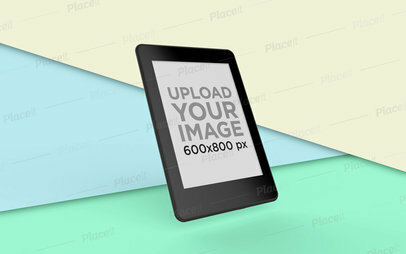 Go and check out all of Placeit's Kindle mockups to find the one that suits your needs. 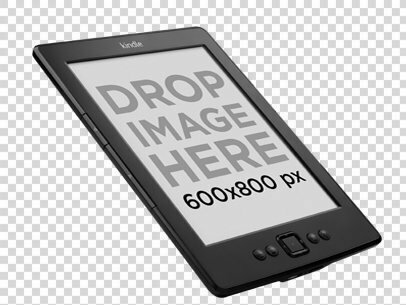 Create attractive marketing visuals to promote your Amazon Kindle designs online! 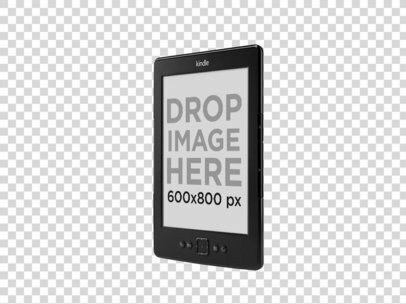 Just find the Placeit render mockup that suits your needs, like this one featuring a floating Kindle facing upward over a plain surface, the perfect angle to promote your design in a professional way! 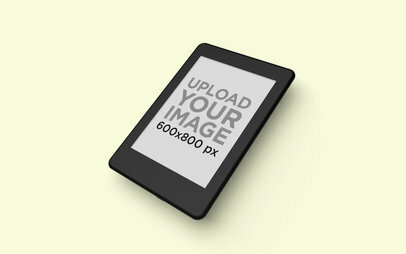 Check out all of Placeit's Kindle mockups right now! Looking to showcase your latest book covers on a Kindle? 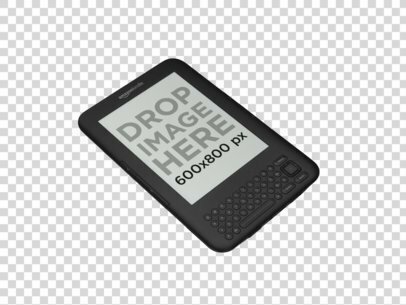 Try any of Placeit's mockups, like this one featuring an Amazon Kindle facing front in the middle of a custom background. Scroll through Placeit's tons of different mockups and promote your designs online today! 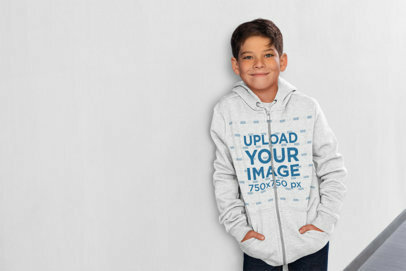 Start promoting your brand with Placeit's render mockups! Create professional and attractive visuals with this Amazon Kindle mockup floating over a minimalist surface, the perfect way to improve your marketing strategy. Find the right Placeit mockup and boost your brand reach! 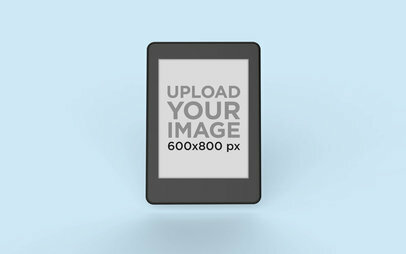 Start promoting your Amazon Kindle designs with Placeit's smart mockups! Check out your latest book covers displayed on this Kindle mockup, you can change the background color or make it transparent. With Placeit's customizable mockups you can improve your marketing strategy and reach a greater audience, try this one or any of Placeit's Kindle mockups today! This Macbook mockup template features a pretty lady using her sleek Macbook Pro to do an important research at the library, she could be working on her master's degree or preparing a class or presentation, it's up to you to decide what shows on the laptop's screen. All you need to do is drag and drop a screenshot straight into the macbook pro, or simply type the URL above and Placeit will do it for you. Use this macbook mockup right away to enhance online marketing. Start using this beautiful mockup featuring an iPhone X and promote your latest app or responsive website in a much better way! You just have to drag-and-drop your design image file over the upload button on the left or capture a site's screenshot using the Screenshot from URL button. Simple, wasn't it? Use Placeit and promote your latest product in a much better way! Try another iPhone X Mockup! This stock photo image features a student using his macbook pro while sitting on the school's hallway. He could be finishing some homework or doing research for a science project. The possibilities are endless and it's up to you to decide! Don't miss the chance to use this great image as part of your visual marketing campaign for your new website. Appeal to your target market by using real-life scenario mockups and make an impact on the market! What are you waiting for? Start using mockup templates today! This laptop mockup is the perfect place for you to showcase your new webapp or website while being used in a real-life scenario that relates to your consumer demographic. 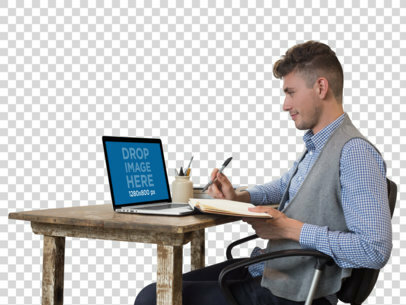 Use this MacBook Pro mockup of a professional lady typing on her laptop to advertise your app in a compelling manner, all you need to do is drag and drop your screenshot straight into the Macbook, Placeit will deliver a beautiful image for you to use for app marketing purposes. See more MacBook mockups here! This is a great Desktop PC mockup because it allows you to display different types of apps and websites within a great in-use context. 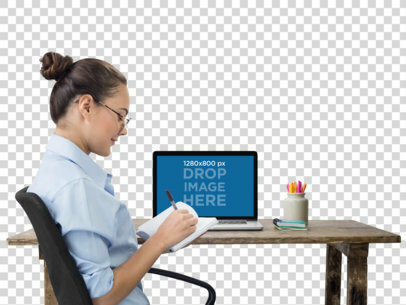 This is a very useful scenario, it features a young woman using her Desktop PC to complete a research paper due next week, the lightning in the image is bright and clear and the main focus is the computer's screen, in which you can place your new website or app. All you need to do is drag a screenshot of your website straight into the monitor's screen, or you can just type the site's URL above and it will automatically convert into a screenshot. The end result will be a great image providing an insight on your webapp, you will be able to share this with coworkers, partners and most importantly, your potential users. Try it out now! It's time to bring out the best visual assets you have to promote your latest work! 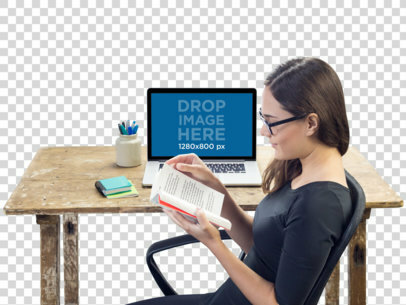 This mockup can do wonders for your marketing strategy, go ahead and try it out by simply placing an image of your artwork over this mockup template of a hipster girl reading her Kindle while sitting. Your cover will look incredibly realistic thanks to our mockup generator, plus it saves you time and money! To see another Kindle Mockup click here! Never go back to Photoshop again with this incredible photo mockup tool! 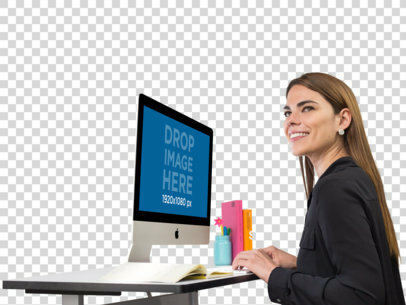 You can try out this mockup of a woman working at her desk on her iMac by only placing your image over the photo template, Placeit’s mockup generator will handle the rest. Get instant mockups with our handy marketing tool and make your advertising attractive again! To see another iMac Mockup click here! 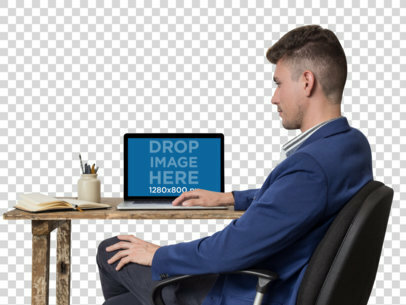 Display your latest web app design with this incredible photo mockup of a MacBook Pro used by a young man in a suit working at his desk. 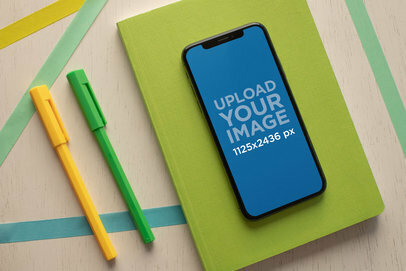 Simply drag and drop your image over the template and our mockup generator will create your instant mockup in no time. You can try out more Macbook mockups to showcase your app in different scenarios to your clients, see them now! To see another MacBook Mockup click here! 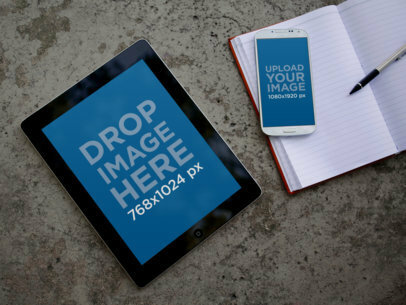 This iPad mockup template features a black iPad and a Samsung Galaxy laying on top of concrete. The Samsung Galaxy is laid on top of a notebook. Directly next to the Samsung galaxy, we also have a pen. This is a great mockup template for anyone focusing on taking notes, reading, reserach or productivity use cases. This template could work for business users or consumers. Use this latop mockup to advertise your latest website and appeal to your consumers tight away. 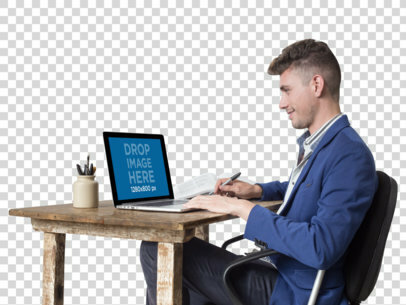 This stock photo template features a businessman at the office working on his laptop and going through some paperwork. This is a great stock image that will allow you to display pretty much any kind of website you can think of. Just drag and drop a screenshot of your website onto the laptop's screen on the template or input a URL address and Placeit will do the rest of the work for you. What are you waiting for? Make this amazing stock photo your new marketing tool now! Display your new ebook cover in the most realistic way possible with our Kindle mockups! 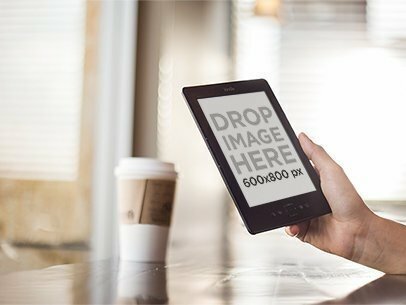 This new digital mockup features a person holding their Amazon Kindle at a coffee shop, it's a great scenario to insert your artwork into. See for yourself by only dragging and dropping your image of choice over the placeholder and you'll have your download ready in just seconds! To see another Kindle Mockup click here! 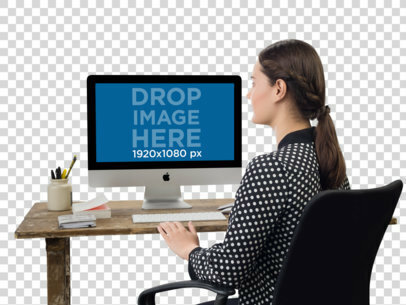 Check out this super realistic mockup of a woman using her iMac at her work desk. Imagine your app design on the screen, then again why don't you try it out? Simply place your image over the mockup template and you will have your download ready instantly thanks to our mockup generator, easy right? All the mockups you need are in our variety of curated scenarios fit to your app and clients' needs. Go ahead and choose more mockups to create a bigger campaign! To see another iMac Mockup click here! 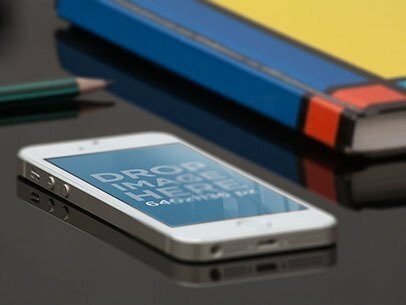 This iPhone 6 mockup template features a young man using his black iPhone 6 in an angled portrait position while waiting for his next class at school. The environment seems to be a modern university with outdoor hallways, the perfect place in which you will be able to display your brand new iOS app or mobile responsive website as a part of your app marketing strategy. 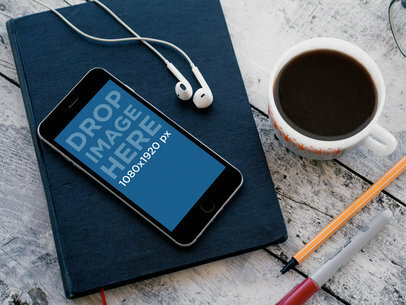 Go ahead and use this iPhone 6 mockup template right away to enhance your visual content. This iPad mockup template features a young woman holding a black iPad in landscape position as a couple of kids are studying in the background. Use this iPad mockup template to promote your latest iOS education app as a part of your app marketing efforts. To see another iPad Mockup click here! 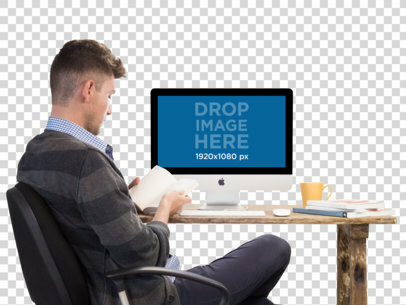 Go ahead and drop your latest app design in this mockup template featuring a man at work reading at his desk with his iMac, let’s see how fantastic it looks! Try out this digital mockup to pitch your next app idea and never regret the switch from Photoshop. Our mockup generator can create hundreds of customizable mockups in just seconds, so why look elsewhere when all the photo mockups you need are right here? To see another iMac Mockup click here! Don’t miss out on this Placeit mockup template and this ultra-cool vibe to showcase your new website or android app. 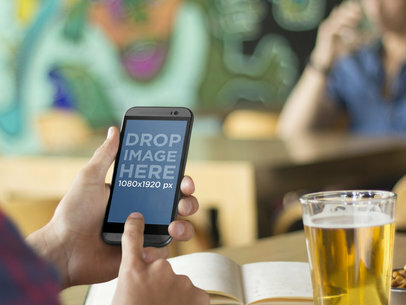 Featuring a young college student having a beer, while checking out your new website or android app on a black HTC One smartphone he holds in portrait position, over a bowl of nuts and study book. The backdrop is a cool and colorful college lounge and the perfect scene to show off your new website or app. Whether this young man is studying for finals, researching a thesis paper or just planning a fun fraternity party, he needs your new website or android app to do it. This Placeit marketing template is a fresh, hip and dynamic frame that caters to a wide variety of websites and apps. Creating a custom mockup of this template is fast and easy. Just drag and drop a screenshot of your new app or website directly onto the HTC One screen, or you can click on the "Grab Screenshot From URL" button above the photo and type in the URL so Placeit can do it for you. Appeal to your specific target market with Placeit marketing tools today. See more Android mockups here! This iPhone mockup presents a very interesting scenario, we can see the black iPhone 6 is laying in portrait position next to a book or notebook, next to it there are other elements that suggest someone is either doing some studying or quick work. There is a fancy red pen, a cup of black coffee and even some white apple headphones that make us think this person is listening to some music for concentration. Imagine your education or productivity iOS app being displayed within this iPhone 6 With Book and Coffee Mockup Template scenario, it would look amazing, right? Now stop imagining and make it happen! All you need to do is drag a screenshot of your own app straight into this iPhone’s screen, or simply type the URL of your mobile responsive website above and Placeit will adjust it to deliver an amazing image carrying your app’s design and features so you can share it with potential users and clients. This Macbook mockup template provides the perfect environment in which you will be able to display your new website or webapp in a compelling way that will create an impact on your consumer demographic. 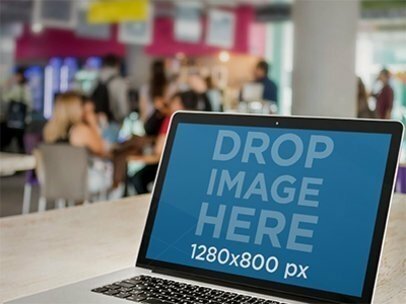 This macbook stock photo template features a young brunette lady using her laptop while at a cafeteria, she could be at school or the mall, it is up to you. Enhance your app marketing campaign right away with this macbook mockup tool. Ready to promote your web designs with photorealistic mockups? Try this MacBook Pro mockup featuring a modern office space, your new design will look great on it and it's very quick to use too. 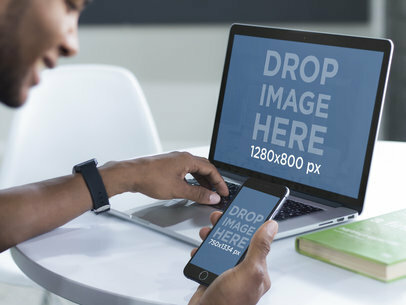 Simply drag and drop your image over the mockup template and Placeit will take care of the rest, get instant mockups in just seconds and forget about hours on Photoshop! To see another MacBook Mockup click here! 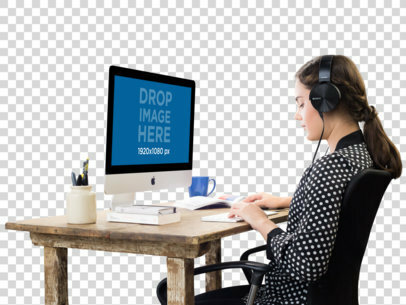 Display your next web app design in a realistic way on this digital mockup of a woman working on her iMac while listening to music! It's the perfect scenario to deliver a relatable experience to your audience, all you have to do is place your image over the template and your download will be ready in no time! Create compelling visual assets thanks to this useful mockup tool. To see another iMac Mockup click here! Display your new web app design on this photo mockup of a Macbook Pro on a wooden desk featuring a young office woman writing in her agenda. Your app will look very realistic, plus the PNG background will let you choose different scenarios to advertise your product! 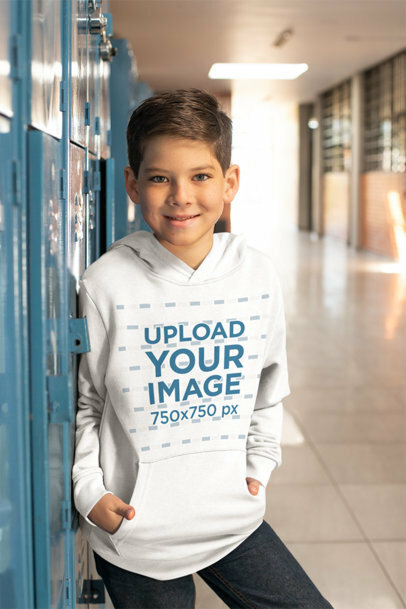 Try it out by dragging and dropping your image over the mockup and our mockup generator will take care of the rest so you only have to download! To see another Macbook Mockup click here! 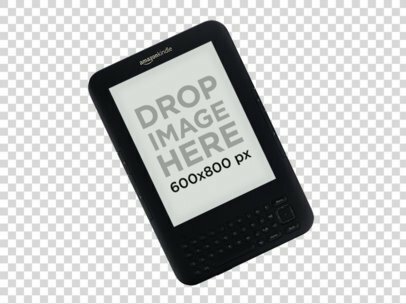 Is your latest ebook cover finished to display? 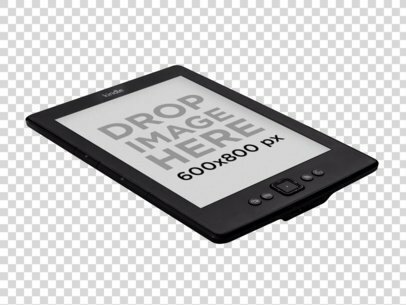 Get it on this Kindle mockup over a transparent background to promote your ebook, all you need to do is upload one of your own images and our mockup generator will start creating your mockup in no time! 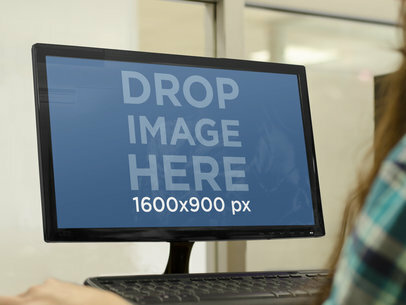 Try it out now and promote your titles with great photo mockups! To see another Kindle Mockup click here! 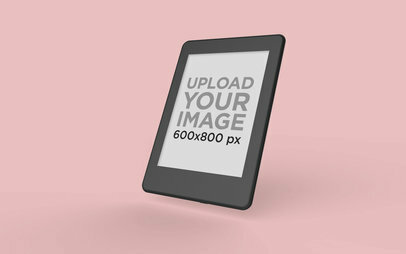 This Kindle mockup is just the visual asset your artwork needs to catch your consumer's attention! Isn't this shot realistic? Try your design on it by simply dragging and dropping your image over the placeholder, you'll have a download ready in no time. Choose more Amazon Kindle mockups from our wide variety of digital mockups, they are the best you will find! To see another Kindle Mockup click here! Ready to see your new ebook cover on this amazing Kindle mockup? Try it out by simply dragging and dropping your image over the template and our mockup generator will instantly adjust to create your final visual asset. Make more customized mockups with our mockup tool and start doing your ebook marketing the right way! To see another Kindle Mockup click here! Create your own Kindle eBook mockup with this incredible Amazon Kindle mockup angled over a transparent background. 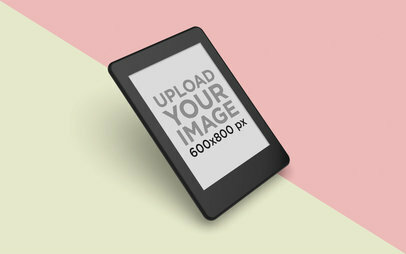 This is just the digital mockup you need to display your latest cover designs for your e-readers! Give it a try by simply dropping your image over the template and our mockup generator will create your personalized Kindle cover mockup in no time, you'll love the final asset! To see another Kindle Mockup click here! Customize your own digital mockup in seconds with our easy to use mockup tool! Try it out now by dragging and dropping one of your designs over this mockup template, your download will be ready in no time! Check out this mockup of a MacBook Pro at a wooden desk with someone working on it, a great scenario to display your latest work in a realistic way, plus it's much cheaper and quicker! To see another MacBook Mockup click here! Don't forget to check out this incredible MacBook Mockups Guide! Take a look at this awesome app marketing mockup to display your latest web designs! 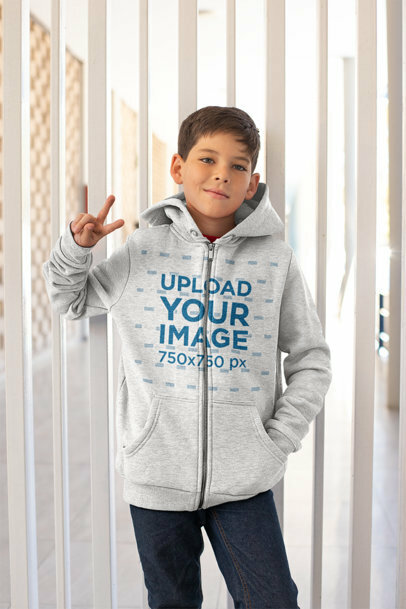 Try it out now by simply dragging and dropping your image over the placeholder and our mockup generator will handle the rest. Get more out of your budget with digital mockups curated perfectly by Placeit. So what are you waiting for? Use our mockup tool now and boost your app in no time! To see another MacBook Mockup click here! Create your own digital mockup with this cool mockup template of a man working on his MacBook Pro while writing in his notebook. Use photo mockups to build compelling branding campaigns for your app designs and web designs! This mockup is ready to use by only placing your image over the template, you'll have the final asset ready in just seconds, cool right? To see another MacBook Mockup click here! Test this digital mockup now with one of your app designs to see how cool it will look in real life. Make photorealistic mockups part of all your marketing campaigns and seal the deal instantly! You just have to drag and drop your image over the mockup template and the mockup generator will take care of everything else! Go ahead and choose a mockup to promote your business! To see another MacBook Mockup click here! We also have iPhone Mockups, check them here! 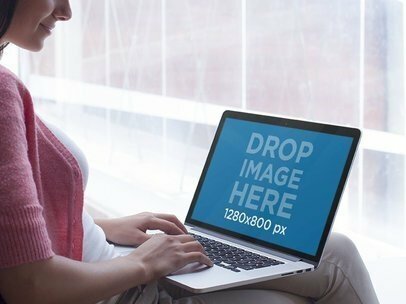 Customize this awesome mockup of a Macbook Pro atop a wooden desk while a woman is reading nearby, try it out by simply dragging and dropping in your image over the photo template. You are going to love how fast and easy our mockup generator is, you can choose from hundreds of mockups to build your own curated campaign in no time. To see another Macbook Mockup click here! This is a Macbook Mockup that will become your business' best way to showcase its new website, features and technology. To use the screen of the Macbook to show your image is really simple, all you need to do is drag and drop it there or type the URL above and Placeit will do it for you. Use mockup templates like these to promote your app marketing campaign.